NASA is testing out the next generation of lunar rovers, conducting field tests in the Arizona desert. Engineers, astronauts and geologists are driving rovers through terrain similar to the Moon’s surface to see if they can perform as advertised when humans return there, hopefully by 2020. One configuration of the rover leaves the crew members free to get on and off the vehicle whenever they like, but they must wear spacesuits at all times to protect them from the lunar environment. The second configuration, the Small Pressurized Rover, (SPR) adds a module on top of the rover’s chassis where the crew can sit inside in a shirt-sleeves environment as they drive the vehicle, donning spacesuits whenever they want to get out. Other concepts tested include robot scouts (think R2D2) and improved spacesuits. For the pressurized module, spacesuits hang on the outside of the vehicle, but astronauts can get into the suits from inside the rover. For the first week of tests, the SPR has been driven on day-long trips to determine how each configuration performed. These have been some of the longest drives the prototype has ever made, but next week the group will step it up another notch or two, by going on a three-day drive through the desert in the SPR to determine how it performs and whether it’s comfortable enough for long-duration trips. NASA’s 11th annual Desert RATS (Research and Technology Studies) field tests have two teams of one astronaut and one geologist to test a variety of lunar rover concepts that will help future astronauts explore the moon further than ever before, construct a long-term lunar base and conduct a wealth of science experiments. During the first use of such rovers on the Apollo missions, astronauts completed almost 20 traverses across the surface of the moon. With each successive mission, NASA improved the rovers’ capacity, increasing the number and duration of exploration missions astronauts could complete on the lunar surface. The SPR concept could provide the astronauts’ main mode of transportation, and could also allow them the flexibility to work inside of it without the restrictions imposed by spacesuits. The adaptable vehicle features pivoting wheels that enable “crab style” movement to help the rover maneuver through difficult spots. Its cantilevered cockpit does not obstruct the driver’s visibility of the terrain ahead. Early concepts provide an exercise ergometer that allow crews to exercise while driving and simultaneously charge the vehicle’s batteries. 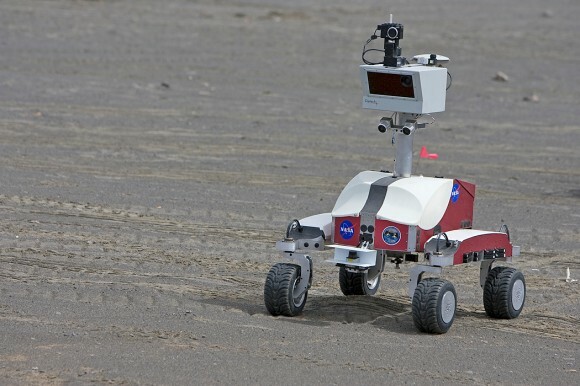 The Mobility Chassis can be configured in an unpressurized rover (UPR) configuration, with astronauts in spacesuits riding in rotating turrets and can also be used without the pressurized module. Astronauts may also ride in the turrets with the SPR in place, minimizing time for suit changes. The modular design will also allow attachment of various tools that may be needed on a particular mission, such as winches, cable reels, backhoes and cranes. The dust on the Moon looks alot looser than anything our deserts are made of. I think they’ll get “stuck in the mud” if you know what I mean…. I have a doubt about these rovers: didn’t it get proved back in the Apollo days that these open-wheel vehicles were not such a good idea, since they tended to blow regolith all over the place, including over the astronauts themselves? Why are they now testing once again open wheel vehicles? I agree with Jorge on the OWV design. Testing in the desert is all well and good, but how does this really tell us about duties on the moon? Are they factoring in the significantly reduced gravity, and ultra fine Regolith? Corse silica is not a fair substitute, especially at 1G. If they choose an OWV concept, they may also have to consider better decontamination procedures to avoid regolith being scattered all over the place, and respiratory issues from inhaling the fine dust. Does Canada need to develop another state of the art aerospace company to then turn over the minds to NASA just to create something original? (Re: Avro Arrow) C’mon guys. decades later and all we are doing is repackaging old ideas. Early concepts provide an exercise ergometer that allow crews to exercise while driving and simultaneously charge the vehicle’s batteries. So they might as well be biking? Well – beats golf, I s’pose. They’ve learned a lot form past lunar exploration vehicles, and indeed other aspects of lunar missions. I’m sure they’re putting it to good use, and don’t just have a bunch of young hothead engineers just randomly going around making things because they reckon it’d be ‘cool’. Wouldn’t the OWV concept work if they added fenders? That should keep a majority of the regolith in check. Hey, I’m not complaining; I’m just asking. I do want to know why is it that they are testing open wheel vehicles, for I thought they had serious problems with them in the past. Did they overcome these problems with new wheel technology or something of the sort? Are they planning to add fenders later on? In short, what’s going on? I once was ignorant to the incompetence of those in charge. That’s why everyday I thank Bush for the enlightenment. You would like to think that after millions being spent that things would be in order but just look at the Ares program. Looking at the footage of the Apollo Lunar rovers. They had a dust problem because that design was too rigid, Every time a wheel left the ground it kicked up a lot of regolith. Keep the wheels on the ground and the dust should be fine. But a Microwave broom the front of the thing, drive over your tracks a few times and you will end up with paved roads. An alternative design would be to have a huge flexible wheel or ball. For some reason I think this would work well on the moon. With some thrusters you could also (hop) greater distances in micro gravity. Well maybe the reason the spacesuits are on the outside is so that they don’t bring the regolith dust back into the vehicle. It looks to me from the pictures like they might just climb in and out of the spacesuits from inside the vehicle. Astrofiend … THANK YOU!! 🙂 I was thinking the same thing reading the second response. I’m amazed at how quickly people react. Rather than asking why, it’s more of a question and interest in what they’ve done to overcome past issues, like OWV design as Jorge alluded to in his follow up. This is a really sensible idea. I remember from the Apollo days that getting into the suits was a huge ordeal. A pressurized vehicle puts human eyes and brains on the job without the hassle of suiting up. I bet it would surprise us how RARELY they really need to put on their suits to get their work done. I don’t think they kicked up much dust unless they were really hot-rodding. I saw on NASA TV that they hope to take trips of up to a thousand miles… yet it has to return to a charging station every 65 miles. Little problem here? How about some solar panels, an RTG or a towed charging station? The idea of an exercise bike charging the battery is pretty ridiculous. Use up oxygen and generate CO2 for few watts? Come on NASA! If it’s going to rove, it needs to be independent. You probably couldn’t get out and walk home. I just read that Lance Armstrong just cycled up 360 watts per hour. I wonder how he’d feel about going to the moon?